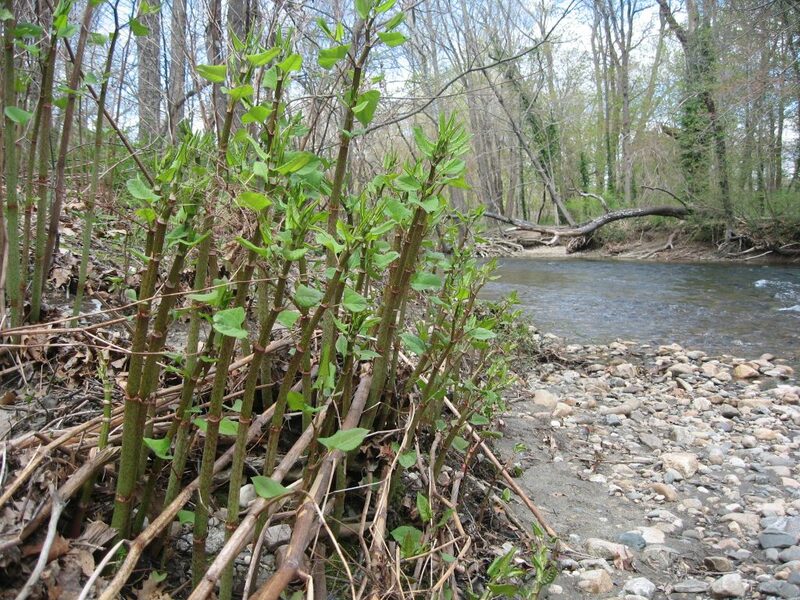 You may never have heard of Japanese knotweed, but there’s a good chance it’s growing right in your backyard. 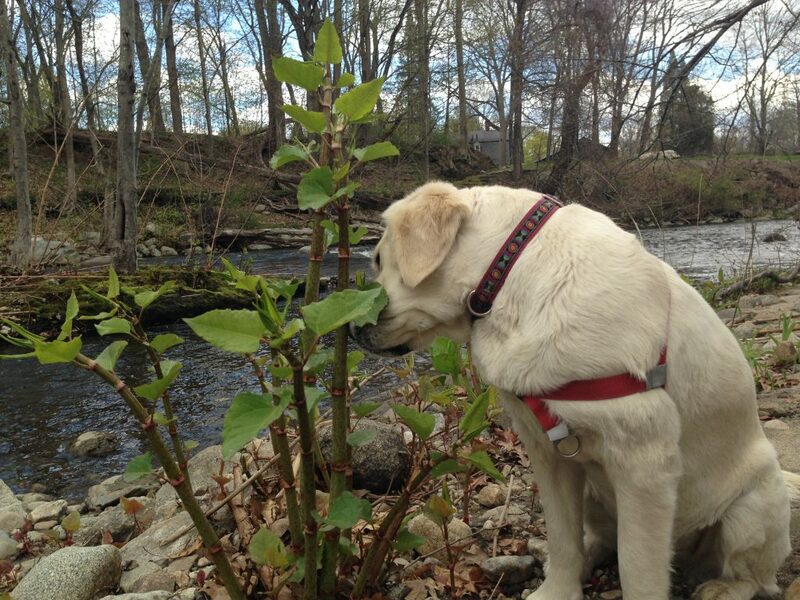 It’s actually an invasive plant from Japan (go figure!) and it’s become so widespread that most people consider it a pesky weed. 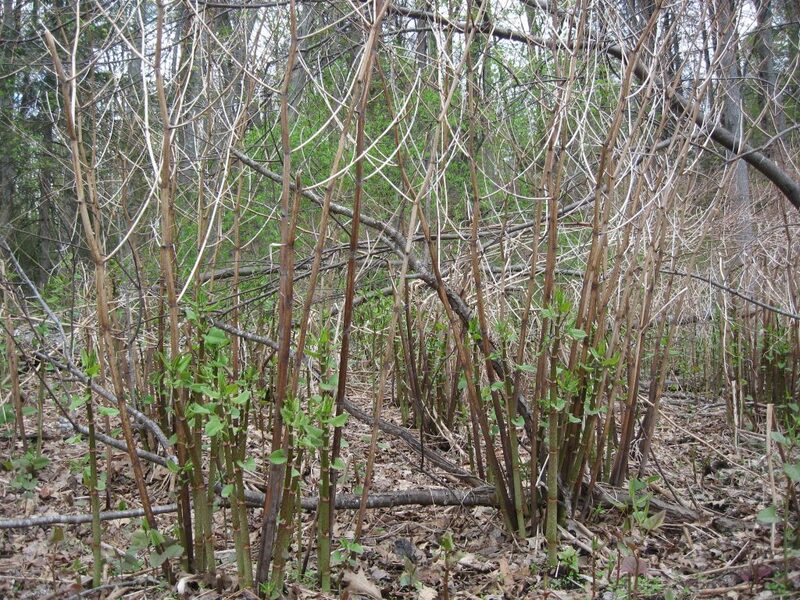 But as wild spring edible enthusiasts like to say, “It’s KNOT as weed!” It is in fact, edible. 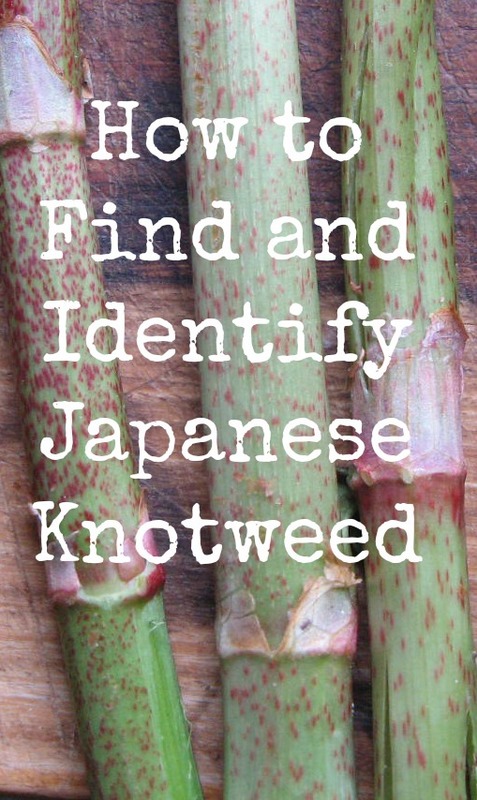 And today I’m going to show you how to find, identify and cook Japanese knotweed. 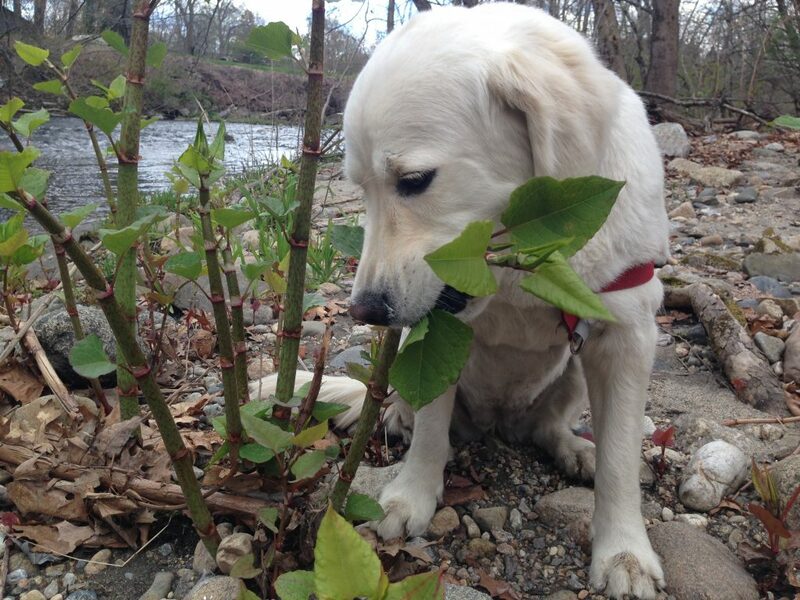 But first, let me tell you my absolute favorite thing about Japanese knotweed. And that is, that unlike other wild spring edibles, you really don’t have to worry about killing yourself! You can eat it raw and there’s really not a poisonous relative that you can mistake it for (at least not one that I’m aware of). It has a tart, sweet flavor sorta like rhubarb. Some people say it has a faint hint of lemon as well. It makes a great little snack when you’re out hiking in the woods with your dog. But you can also cook it and eat it as a side vegetable or add it to other dishes. 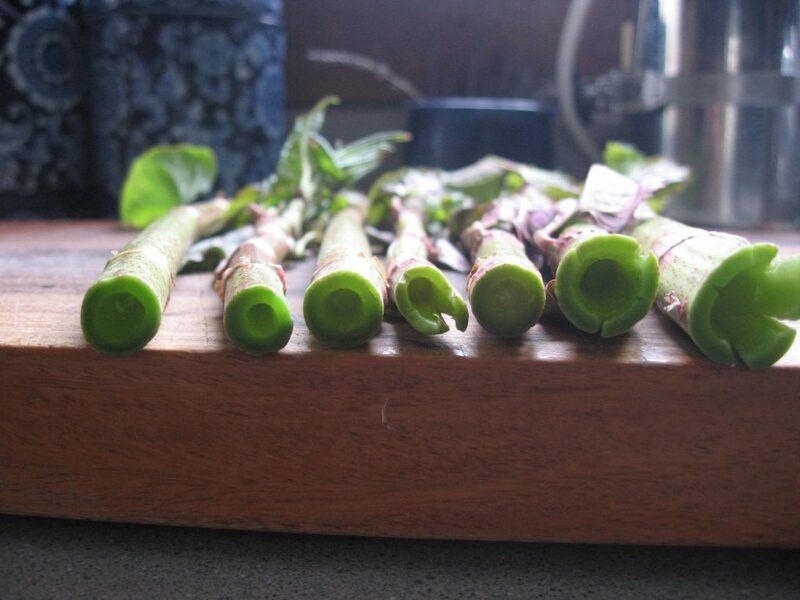 When it first appears in late-April, the shoots very much look like asparagus. But when it starts growing, it grows FAST. So NOW is the time to get it! 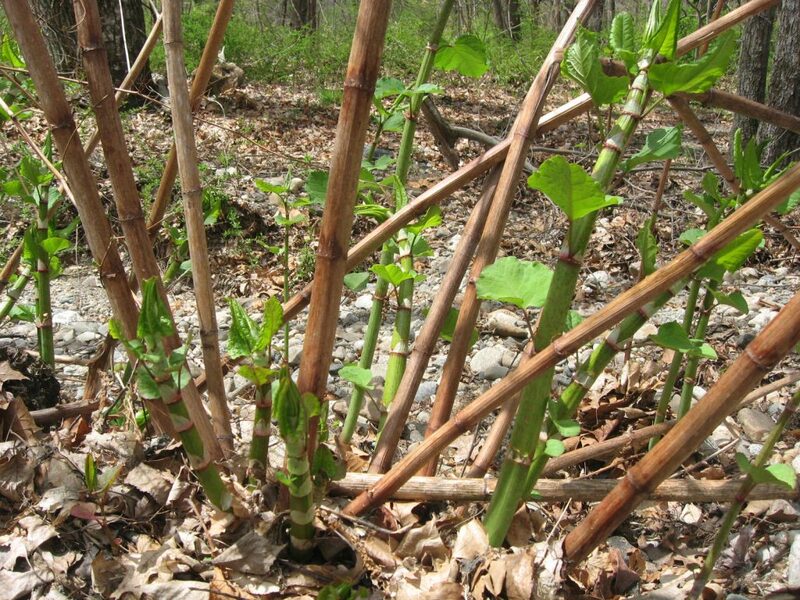 By mid-May, at least here in the northeast, its tender stalks will grow into hardy, bamboo-esque woody ones that grow well over ten feet tall. The pics above are beyond the point at which you want to harvest it. Here’s a pic with Lipton to give you an idea of a good height at which to pick it. Some of those smaller ones off to the left are just about right, about one to two feet. Even shorter stalks than that would be good. Probably the minimum height to pick would be around six inches. At that height the stalks are very supple. Just pinch them at the base and they will easily snap in half. Once they get beyond three feet or so they start to become more fibrous and are no longer tender and edible. Same idea here but check out how tall those dead stalks are. They’re probably around twelve feet high. 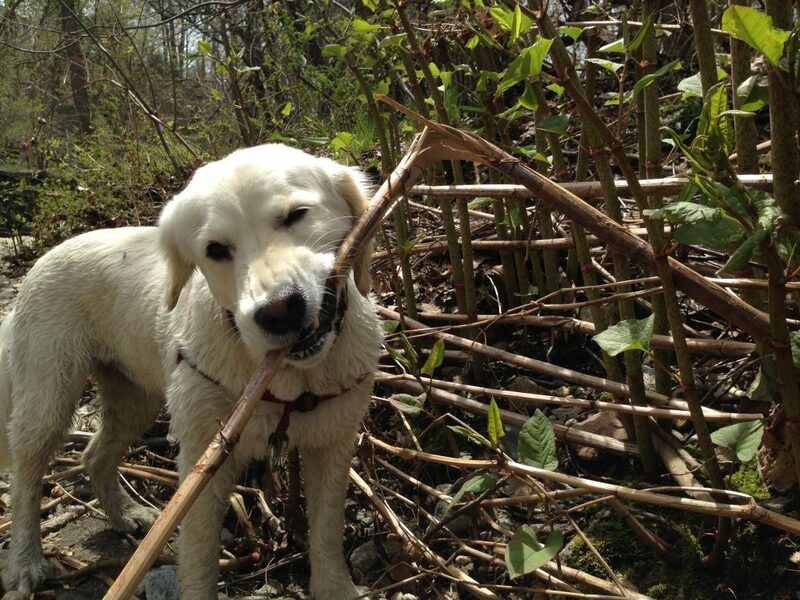 And if you have a dog, they’ll love chewing on those stalks! As you can see, it really does look asparagus. 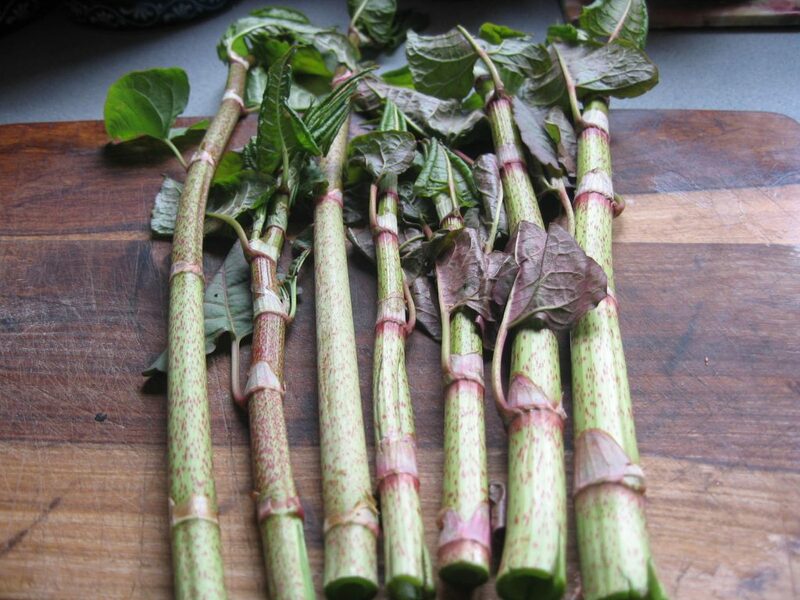 Oh and speaking of asparagus, though Japanese knotweed looks like asparagus, you should know that it doesn’t really taste like asparagus. But you can prepare it very much like asparagus though know it’ll cook a lot faster. Trim the leaves that branch off the nodes. A light saute of about three to five minutes is all you need or you can boil or steam it for a few minutes as well. Top it with some butter and salt. Personally, I think it’s a tad on the tart side to eat as a side vegetable. But it think it complements other things well. I’ll add it to soups, chop it up with some scrambled eggs or saute it with some potatoes for breakfast. It also makes a great addition to salads. And, unlike asparagus, it’s FREE! And you can’t beat that. 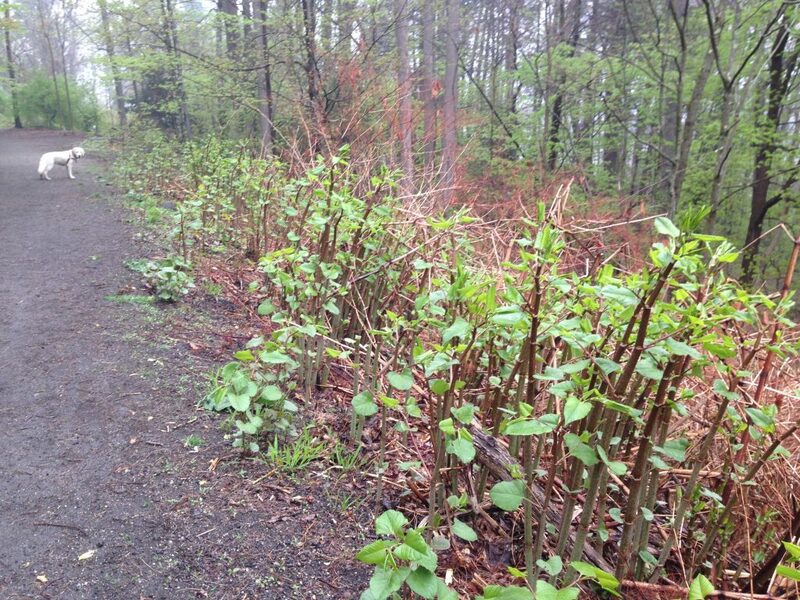 So the next time you’re out walking the dog, walking in the woods or maybe just walking out your back door, look around for some Japanese knotweed. Because now you know… it’s KNOT a weed. 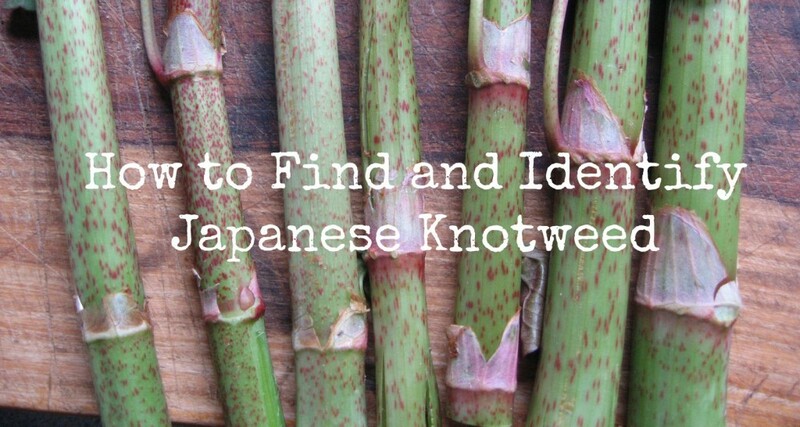 Of course, learning how to find and identify Japanese knotweed is just the tip of the iceberg. There’s hundreds more, many of which grow right in your backyard like dandelions and mint. However, many of them are not easy to identify. 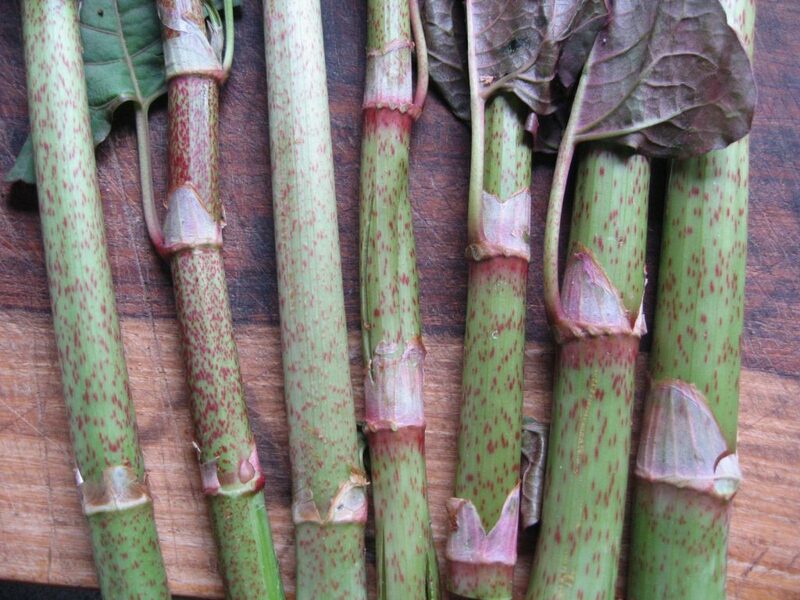 And unlike Japanese knotweed, many of them have poisonous relatives! So it’s good to learn from someone with experience initially. Wild edible walks are a great way to learn from experienced guides and they’re very popular this time of year. 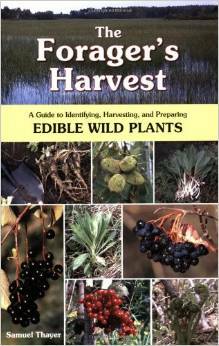 Just google “wild edible walk” along with your town or county and you’ll probably find a few. Once you gain some experience, you want to have some handy resources as well. The Forager’s Harvest by Samuel Thayer. 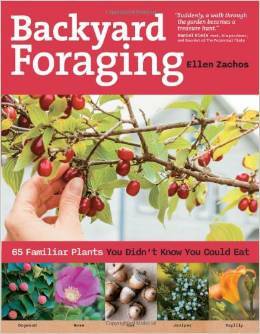 Backyard Foraging by Ellen Zachos (highly recommended if you’re new to foraging). And of course, there’s that thing called the internet too! I called on some of my fellow food bloggers to share their best wild edible posts. 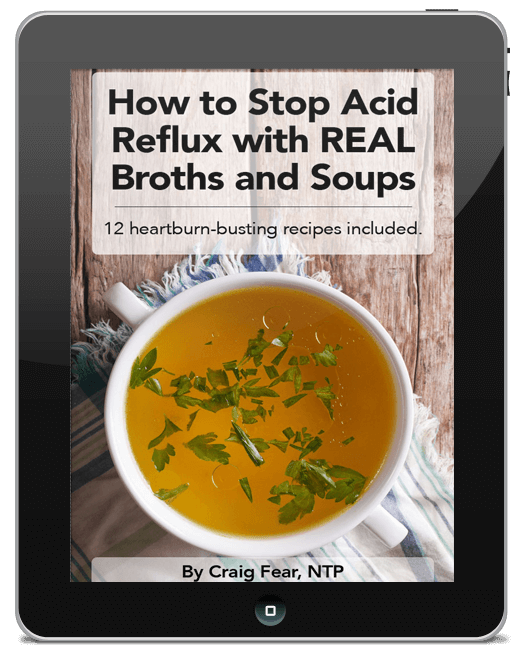 You’ll see that many include recipes as well. I’ll kick things off with my own p0st (and one of my all-time favorites).